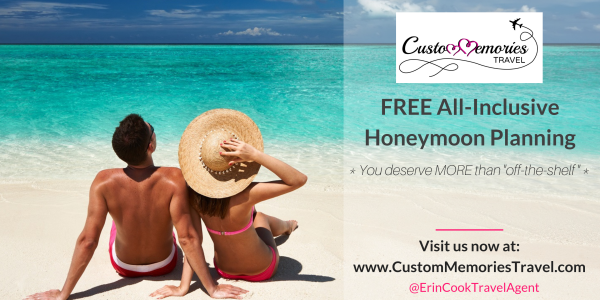 Considered the #1 Honeymoon Travel Expert in NNY, Erin Cook designs beach honeymoons for busy couples by taking the stress and worry out of finding the right vacation for their desires and avoiding the common "online" honeymoon nightmare. Specialty: Making "All-Inclusive" All About YOU! (Free all inclusive planning services) Also planning honeymoons all over the world for customer all over the US! I'm Erin Cook, Owner of Custom Memories Travel. Listen, I know that you have plenty of choices when it comes to planning the perfect all-inclusive honeymoon. And you DESERVE to have the honeymoon of YOUR dreams without all the stress and overwhelm of finding the PERFECT one, right? So, that's why I DON'T SELL honeymoons, I DESIGN them! My totally customized itineraries are personalized to YOU and YOUR needs...not what someone else recommends...we all know how that can go - eek! Honeymoons are more important than that and so are YOU. * YOU decide what you want to spend. * YOU decide on your wish list items. * I'll pack as much of your wish list into your package as possible to design your dream honeymoon!